The land and sea temperatures were record warm over much of the planet in December 2015. Graphic courtesy of NOAA. It’s been like a broken record: Each month’s temperature recently has surpassed all previous similar months’ temperatures. But there has previously always been an outlier — land or sea in northern or southern hemisphere — that didn’t quite set a record. 2015 was an El Niño year, and El Niño years are historically warm. But the spike upwards to record levels cannot be misconstrued as anything natural. The correlation with atmospheric CO2 is unmistakable. And the increase in CO2 is clearly from the burning of fossil fuels. Of course it wasn’t uniformly warm over all parts of the globe, so let’s break it down. What Parts Of The Atmosphere-Ocean System Set December Records For Temperature? The eastern tropical Pacific was not record warm despite an El Niño that is one of the most pronounced on record. The ‘Anti-Blob’ (Decoded Science’s name), a cold pool in the Atlantic Ocean south of Greenland and Iceland, maintains its strength. The full year 2015 looks much like December, temperature-wise. Could this be the result of permanent changes in atmospheric circulation? Graphic courtesy of NOAA. The January through December land and sea temperature map looks remarkably like December’s. Record areas of the Indian, Atlantic and Pacific Oceans were a little larger. Africa wasn’t quite as extensively hot. The Anti-Blob in the Atlantic stands out because it is the only record cold place on the planet for either December or the full year. Climatologists have noted for some time that weather patterns have become more stagnant and persistent in recent years; stagnation and persistence are consistent with longer-lasting anomalies. It is too soon to tell whether these anomalies are permanent. Powerful El Niños are often followed by equally powerful La Niñas. Graphic courtesy of NOAA. El Niño years have always produced a spike in global land and sea temperatures. It seems likely that the rapid rise in worldwide temperatures the last couple of years is partly due to the current El Niño. Typically El Niño is followed by its opposite, La Niña — unusually cool water in the tropical Pacific. 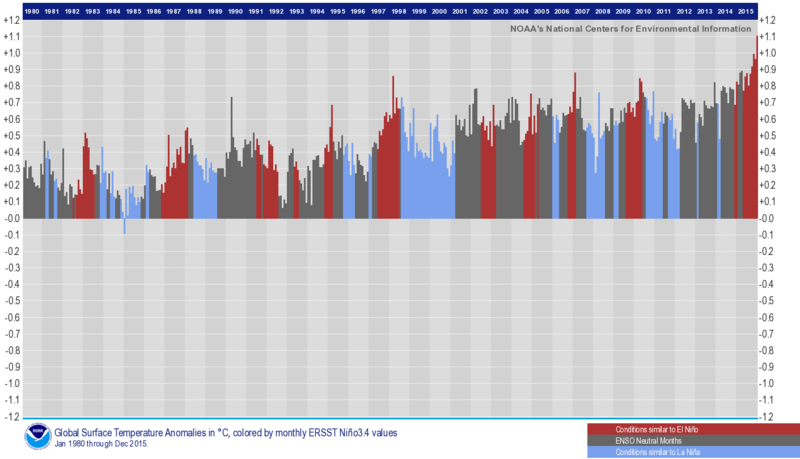 If La Niña develops later this year, there could be a pause in the rapid upward climb of monthly temperatures. But if this happens, no one should take it as a sign that global warming has leveled off. Some scientists (and others) made this claim after the powerful El Niño of 1998. The recent rise in temperatures has shown that the ‘pause’ in global warming after 1998 was an illusion. What Conclusions Should We Draw From The Global Analysis 2015 Report? 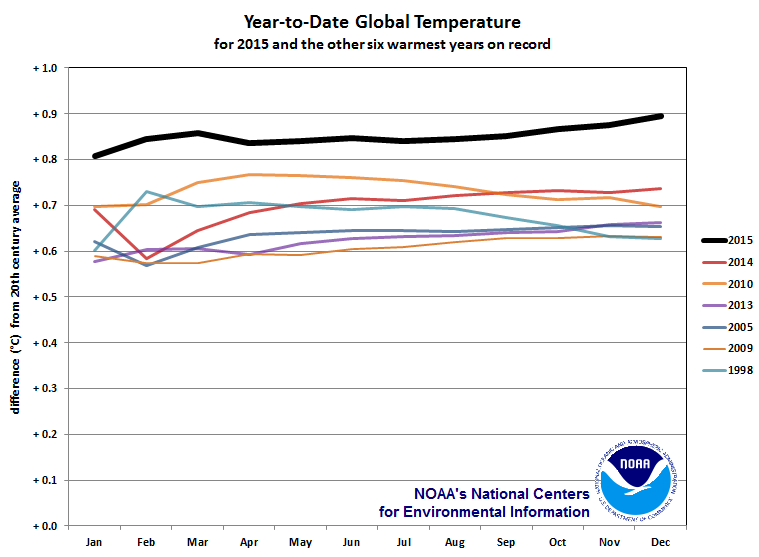 2015 was the warmest year since record-keeping began from start to finish. Graphic courtesy of NOAA. 2015 was clearly the warmest year in the temperature record, which dates not only to the beginning of reliable observations in 1880, but to thousands of years, using tree ring, ice-core, and other data. A respite may be in store as El Niño transitions to La Niña. Or maybe not. Extrapolations of the temperature record lead to different conclusions, depending on the starting points. Scientists often point to a rise of two degrees Celsius (2C) in temperature from the beginning of the industrial age to be the tipping point for the atmosphere. Beyond that amount of warming, meteorologists warn, there is a high probability of cataclysmic changes in weather. If the rate of warming of the last two years is used as a benchmark, the earth will reach the magic 2C temperature rise within a decade. From 1998 to 2015, the temperature rose 0.27C (0.49F), which is 0.016C per year. This year the temperature was 1.1C above pre-industrial levels, so to reach 2C would take 56 more years. The earth will reach the magic 2C in the year 2071 by this conservative estimate. Regardless of how the extrapolation of temperature is figured, there is not a lot of time to deal with the problem. If the temperature increases uniformly over the planet, humanity, an ingenious species, can probably deal with 2C and somewhat beyond. But evidence shows that the warming will not be uniform, and that more extreme and disruptive weather will become common. The arctic is clearly warming at more than twice the rate of the rest of the planet. The implications beyond lower shipping costs are unknown. The Anti-Blob in the North Atlantic Ocean is particularly worrying. The best explanation is that melting glaciers in Greenland are creating a cold pool of water with low salinity (saltier water is denser than less salty, so low-salinity water stays at the surface). This could lead to what some climatologists have long feared: a disruption of the Gulf Stream circulation. The result could be much colder weather in Europe, even as the rest of the world bakes. Other more dire predictions cannot be discounted: That melting permafrost will release large amounts of methane, a potent greenhouse gas, leading to a runaway greenhouse effect a la Venus; or more realistically, that warming oceans will produce more — and more powerful — hurricanes and typhoons. We live in a thin and fragile gaseous envelope around our planet, and we are changing it in dangerous ways. The climate agreement reached at COP21 showed that cooperation among countries is possible. Yet, even with the best of what countries have offered to stem the rise of atmospheric greenhouse gases, a temperature rise well beyond the magic 2C is likely. The global temperature data from December and full-year 2015 indicate that man’s ingenuity will be tested.